Dockside Foods is a Seafood Company based in Ft. Lauderdale. We are passionate to make the highest quality of seafood specialties. Our specialty Key West Style Crab Cakes are made with fresh lump and claw meat. We add vegetables and special spices to help the flavor of the keys come out in every bite. We use the same recipe to make our Key West Style Crab Cake Mix- Ready to Use. You can create your own custom seafood dishes. Such as stuffing for you fish, and mushrooms. You can also make any size crab cake or slider. We also make specialty fritters: Conch, Clam Bake and Lobster and Corn. Each fritter is made with a blend of vegetables and seasonings to become the unique flavor of each. We are passionate to make the highest quality of seafood specialties. Key West Style Crab Soup with Stone Crab, Conch Chowder, Lobster Bisque, and Clam Chowder. What’s great about our soups are, you add the liquid and you cook the soup for the very first time. The vegetables are still crunchy and taste homemade. 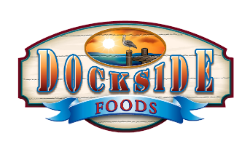 Since 2010 Dockside has been supplying restaurants and caterers ,Throughout Southeast Florida, and Southwest Florida. Meet the people that make our company special. These are the people that work day in and day out to make your food dreams come true. These are just some of the food items we make. Click through to see our entire portfolio.